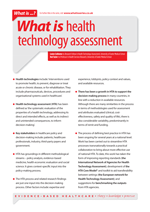 What is health technology assessment? | Whatis Series...? Health technologies include: ‘interventions used to promote health, to prevent, diagnose or treat acute or chronic disease, or for rehabilitation. They include pharmaceuticals, devices, procedures and organisational systems used in healthcare’. Health technology assessment (HTA) has been defined as ‘the systematic evaluation of the properties of a health technology, addressing its direct and intended effects, as well as its indirect and unintended consequences, to inform decision-making’. Key stakeholders in healthcare policy and decision-making include: patients, healthcare professionals, industry, third-party payers and government. HTA has groundings in different methodological streams – policy analysis, evidence-based medicine, health economic evaluation and social science. It gives context-specific input into the policy-making process. The HTA process and related research findings are just one input into the decision-making process. Other factors include: expertise and experience, lobbyists, policy context and values, and available resources. There has been a growth in HTA to support the decision-making process in many countries, in line with a reduction in available resources. Although there are many similarities in the process in terms of methodologies used for assessment and attributes evaluated (clinical, cost-effectiveness, safety and quality of life), there is also considerable variability, predominantly in terms of remit and funding. The process of defining best practice in HTA has been on-going for several years at a national level. Work has been carried out to streamline HTA processes transnationally towards a practical collaboration to bring about more effective use of national HTA. To date, this work has taken the form of improving reporting standards (the International Network of Agencies for Health Technology Assessment); development of the HTA Core Model® and toolkit to aid transferability between settings (the European network for Health Technology Assessment); and suggestions for benchmarking the outputs from HTA agencies.